THIS IS AN AMAZING PRODUCT! I ABSOLUTELY LOVE IT. I'M IN LOVE WITH THIS PRODUCT! SMELLS AMAZING AND WORKS BEAUTIFULLY! THANK YOU REAL SAINTS & SINNERS FOR GREAT PRODUCTS! I JUST USED THIS STUFF FOR THE FIRST TIME LAST WEEK, BUT IT’S QUICKLY BECOMING ONE OF MY MOST PRIZED PRODUCTS! TALK ABOUT SERIOUS SOFTNESS AND MONSTER SHINE! SAINTS & SINNERS NEVER DISAPPOINT. USED THIS FOR THE FIRST TIME TODAY. I AM IN LOVE WITH HOW SOFT MY HAIR IS AND THE SHINE... OH THE SHINE IS AMAZING. I JUST TRIED THIS FOR THE FIRST TIME TODAY! IM OBSESSED! I WAITED TIL TODAY TO TRY THIS BECAUSE I WANTED TO SEE HOW IT WORKED WITH THE RAIN AND HUMIDITY! IT WAS AWESOME! COMPLETELY CONTROLLED MY FRIZZ! AMAZING PRODUCT!I LOVE IT!!! JUST TRIED THIS FOR THE FIRST TIME LAST NIGHT ON MY CLIENT AND THIS MORNING ON MYSELF. OBSESSED. IT'S THE BEST OIL/SERUM I'VE EVERY USED. BUT REALLY. BEST HAIR SERUM EVER. THE BEST PART IS IT DOESN'T LEAVE A COATING, ONCE I PUT IN MY HAIR OR MY CLIENTS HAIR I CAN FEEL IT START TO ABSORB IN MY HANDS. HERE'S SOME TRUTH... I ASKED MY MOTHER TO BUY THE ILLUMINATI THE NEXT TIME SHE WENT TO TOWN. SHE LIVES IN ALABAMA AND I LIVE IN FLORIDA AND THE NEAREST SALON CARRYING IT IS 3 HOURS AWAY. NOT ONLY DID SHE GET ME THE ILLUMINATI, SHE GOT THE SHAMPOO AND CONDITIONER AS WELL!! THE VERY FIRST DAY I USED THIS PRODUCT A CO-WORKER ASKED ME WHAT I DID DIFFERENTLY TO MY HAIR THAT DAY. SERIOUSLY? THIS PRODUCT IS AWESOME!!! I COULDN'T WAIT TO TELL HER ALL ABOUT IT. 99% HUMIDITY IS AN EVERYDAY OCCURRENCE IN FLORIDA AND I HAVE NO MORE FRIZZ, UNCONTROLLABLE FLYAWAYS. BEST OF THE BEST! I LOVE ALL THE AMAZING THINGS THIS DOES FOR THE HAIR!! MAGIC IN A BOTTLE! DIVINE SOFTNESS, RADIANT ILLUMINATING SHINE AND SENSUOUS SCENT… THE MOST WONDERFUL SHINE AND SMOOTHING I HAVE SEEN IN A SERUM TO DATE! RIDICULOUS AMOUNT OF SHINE ! THIS HAIR ILLUMINATOR MAKES MY BLONDE LOOKS FABULOUS ! Why wouldn't you want your hair to have a holographic sheen? Especially when this styler not only imparts a supercool incandescence to your strands, but also locks out humidity, smooths frizz and safeguards color. Not only does this sweet-smelling goo make my hair behave, but it also instantly adds an iridescent glow that looks so pretty on my frosty blonde. I look and feel like an ice princess, despite the fact I haven't put on a pair of skates in 10 years. Needless to say I'm now fully on board with "holographic" hair and my shine-levels might just give the Duchess of Cambridge a run for her money. Plus, if I can't get a tiara in real life, this will do just fine. You won't be able to stop touching your hair-or looking in the mirror, for that matter-after applying a tiny drop of this sweet smelling serum that adds the most iridescent sheen to even the most brittle, damaged-looking strands. Literally out performs. I can blowout and smooth the frizziest hair so fast now! This product is amazing blow dried into the hair for humidity. My hair stayed straight even in Florida humidity without a keratin treatment. Now I am adding it to all my client blowouts this summer. Such a life changing serum. If everyone tried it just once, JUST ONCE they would be hooked for life!! I am so in love with Illuminati! If I haven't already said that… I'm saying it now. The shine is incredible! I mix a drop of Illuminati Shine Serum into a pump of Divine Styling Potion before almost every blowout. Then I smooth on a little more after the blowout….then maybe a little more after the style is finished…..then I just rub it all over my body…..then I just take a bath in it. Can’t. Get. Enough. In my top five favorite products of all time! Love it! 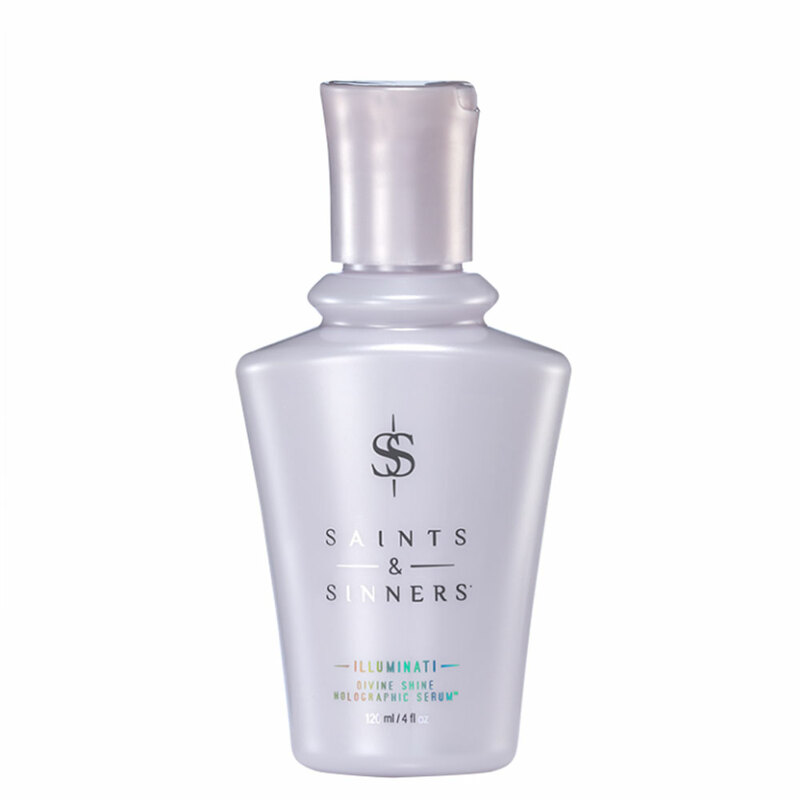 Love our saints & sinners Illuminati Devine shine by @realsaintsandsinners a must have product. Love all there products. Hair never look so good. I'm obsessed with your Illuminati serum!